Mandala Seeds was founded in 2004. The founders together share more than 40 years of experience in cannabis cultivation, breeding, and collecting heirloom strains. One of the founders is a biologist, who has worked professionally in horticulture and agriculture. From their life-long travels and residence in more than 20 countries a genetic repository of many landrace & rare hybrid seeds emerged and is the basis of their breeding projects.The team of Mandala Seeds has also pioneered several unique breeding and seed production methods, whose benefits are valued by growers & breeders worldwide. Mandala strains are famous for their exceptional performance and top grade marijuana. The aim of our seed bank is to provide a consistent high level of quality genetics and seeds at a customer friendly price. 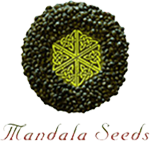 Mandala Seeds is especially dedicated to preserving the health, vigor, and genetic diversity of cannabis and to breed the purest quality and potency. All seeds are from 100% organic production with strict quality control and we manage the seed bank in an ecologically responsible way.